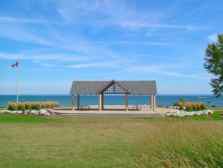 The Crystal Beach Waterfront boat launch is open from May until mid-September. On site parking is available for vehicles with trailers at a cost of $5 for the day. Our convenient pay-and-display machines accept Canadian $1 and $2 coins or credit cards. The Waterfront part offers a pavilion, washroom facilities and a playground. Season Passes for the Crystal Beach Waterfront Park boat launch are now available for $100 (taxes included) for the entire 2013 boating season. To purchase a pass or for more information, come to the Facilities Management office (located in the Leisureplex Arena) or call 905-871-1600 ext 2431.